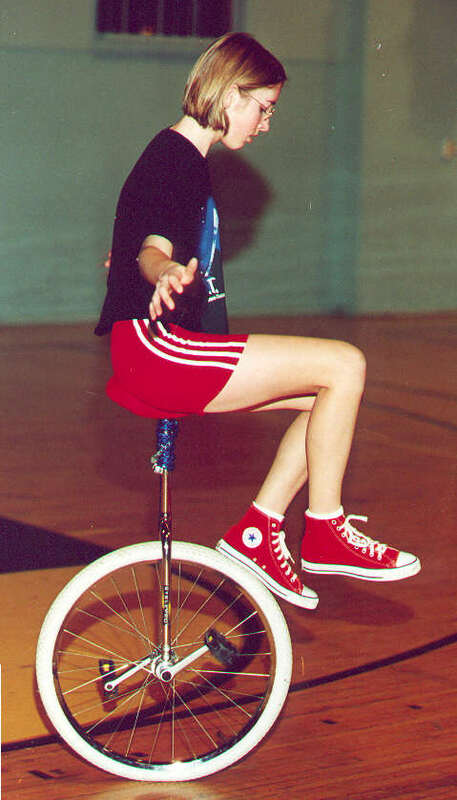 Wheel walking is one of our favorite tricks because it looks so unusual, plus, it's really fun! As you can see in this picture of Tanya, wheel walking involves moving the uni by "walking" on the tire, not on the pedals. We suggest starting by a wall or a fence. Ride until one pedal is completely down and the other is up. Take your foot off the "up" pedal and place it on the tire - it's almost surprising how much control you DO have on the tire. Then put the other foot on the tire also. Don't worry about falling because the first foot is keeping the tire from moving. Next, start walking! Think of wheel walking in terms of regular walking. When you walk down the street, you don't put one foot directly behind the other, you leave a little space. The same goes for wheel walking. Just make sure that one foot is on the tire at all times. With each step on the tire, roll the wheel down as far as you can, then pick up your foot and bring it back to the top. Finding the right speed is hard at first, but practice helps! Continue wheel walking along the wall until you get a feel for it. Pretty soon you will be less and less dependent on the wall, and you can try to take a few steps without it. You will find that you outgrow the wall quite quickly, which means you have to try it without any support! You can start along the wall and then push off and go away from the wall. Or, you can start in the middle of the floor without anything to hold onto and go from idling into wheel walking. As you're idling forward, put the foot that is on the top pedal onto the tire and push it forward. Follow it quickly with your other foot. 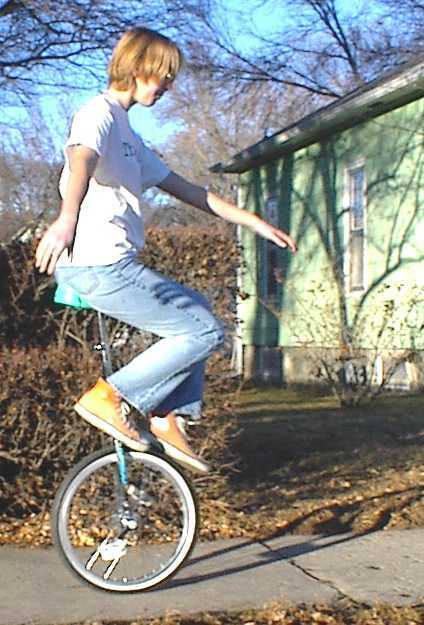 You can also go into wheel walking from one-footed idling (perhaps easier), riding, or mount directly to wheel walking. Try to get as many steps on the tire as possible. Don't go too fast - wheel walking is a slow trick. Count your steps and try to keep beating your record. From experience, we can tell you that it's better to fall off the front than the back. If you feel yourself leaning back too far, dig your foot/heel into the tire more and it will steady you. Returning to the pedals after wheel walking is a bit tricky! You have to line up the pedals just right. For us, we put our right foot on the right pedal when it is on its way down, about horizontal. As soon as you put pressure on the forward pedal, the other pedal will come around and scoop up your other foot. Either that or whack your leg! 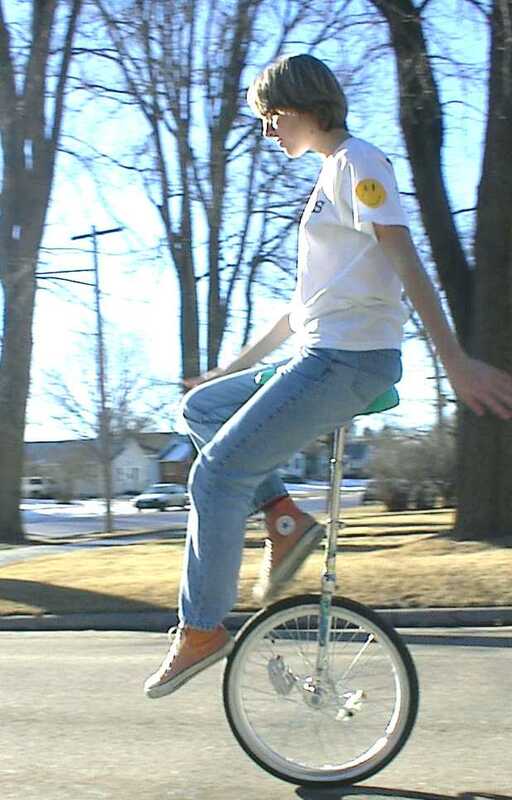 Once you learn how to one-foot wheel walk, a better method of returning to the pedals is to wheel-walk one-footed while your other foot dangles beside the wheel, waiting for the pedal to come around and scoop it up. It may sound hard, but once you learn it, it's actually easier. Yes, there is something better than just wheel walking: one-footed wheel walking! You can go faster this way, and work it into a glide, which is even funner yet. We have just learned to pull-glide, and we are learning to glide. Start with a wall again. Put one foot on the tire, one foot on the frame, and gently scooch the tire along with one foot. Keep your steps controlled and fairly small at first, letting the tire slide under your foot as you bring it back for another step. Use your toe and the front part of your shoe - not your heel. You can get into this position from riding, from idling, from two-foot wheel walking and from mounting. Experiment. As you get better, make your steps bigger. You can feel where you have control. Getting just the right amount of pressure takes practice! Try one-foot wheel walking down gentle slopes and let your foot slither on top of the tire. Once you get this far, be sure to try pull-gliding!